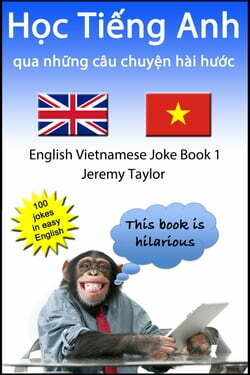 Học Tiếng Anh qua những câu chuyện hài hước 1 (The English Vietnamese Joke Book 1) is a collection of 100 jokes in easy English and is a great way for you to improve your ability to speak, read, and understand English. So how does it work? Jokes: On each page you have a joke in... read more English. The jokes have been selected so that they are not too difficult and don’t rely on puns. Vocabulary: If your English is not great, you can read the Vietnamese vocabulary before you start reading the joke. Translation: If you want to check your understanding, there’s a Vietnamese translation on the following page. Cartoons: Some amusing cartoons will help set the joke in context. The book has proved very popular with thousands of people who have a basic knowledge of English - give the sample a try and see what you think.